Share a meal with local hosts in a G Adventures-supported community co-op..
Bliss out on a remote Costa Rican beach..
Stroll through Antigua's colonial streets.. It's currently high season in Costa Rica. Book today to reserve your seats and lock-in your prices. Take a dip in Baldi's hot springs. Go out on a catamaran boat tour in Tortuga. Trek into a remote community to live with the locals..
Sleep in a cave behind twin waterfalls..
Make your own sugarcane candy.. Relax at Baldi Hot Springs. Zipline through the forest canopy in Monteverde. Discover pristine Manuel Antonio National Park. Suspension bridge treetop walk in Monteverde Cloud Forest. Guided walk to Arenal Volcano and boat crossing of Lake Arenal. “Me and my travel companion, have been talking about how well done and amazing our Coast to Coast adventure was everyday since we completed it. This has brought big smiles to us. Every moment was well done, right from the start with Juan Carlos picking us from the airport to the day he said goodbye. Juan Carlos is an amazing and knowledgeable man. This can also be said for the other crew you have working for you as well. Memo, the man that knows everyone is an amazing cook and support ( I hope his back stays strong), Julio the kayak safety guide will be a very good guide with his passion for the jungle, rivers, wildlife and people and the wild fruit he shared with us. Juan Carlos is so friendly and helpful. He gave us so much information about the areas we visited, the people we meet along the way and the different plants and animals. The organization JC and Memo provided was 5 star. “I write this email to send a HUGE thank you to the recent team who made this experience in CR a lifetime beautiful memory. From the moment we were met at the San Jose airport it was a seamless, well organized trip. For the next 12 days our guide Juan Carlos(JC), our driver Memo and the boys made us feel like family. The entire trip was exhilarating.. a sensory experience and sensation .. from the activities each day...the food.. the local changing scenery.. the teams knowledge...and being in the most wonderful and varied locations each night. The accommodation never disappointed me...the small tents.. then a lovely hotel room. Santa Maria and then the hill climb the next day. The Soda eateries.. Memo & JC food.And and and and and.. the list is too long to type.It was utterly beyond my expectations. Please say thanks to the team. As we sit in Santa Teresa surfing we recommend this trip daily to others. The Republic of Costa Rica is a country with a progressive environmental mind, and a rapidly developing economy. With one of the world’s most enchanting and diverse bio-diversity, a trip to the country is packed with viewing exotic flora and fauna, rivers, and beautiful beaches that is great for water activities. 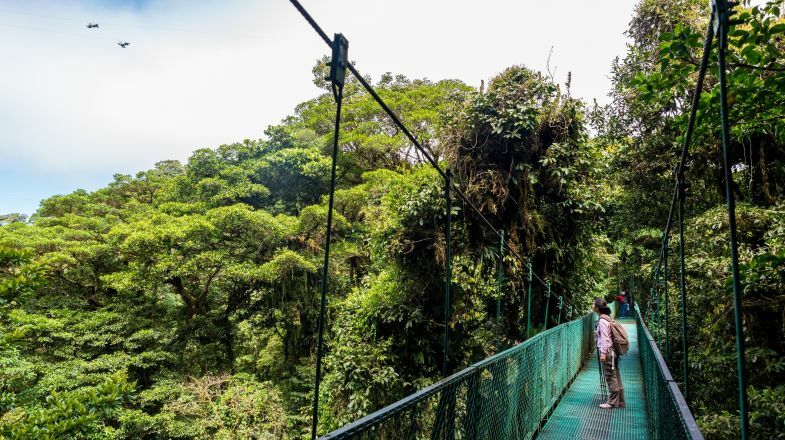 Get to know over 3,000 species of animal in the Monteverde Cloud Forest Reserve. Zipline through the cloud rainforests. Feel the vastness in Poás Volcano National Park. Dance your feet off while enjoying a quick samba or merengue. Enjoy local tamales and other wonderful cuisine. Visit the Basílica de Nuestra Señora de los Ángeles (Basilica of Our Lady of the Angels). Prepare for the rain. Costa Rica is mostly rainforest, so the climate is humid and rainy except Guanacast which is known as the ‘dry region’. Go with a tour guide; they know what they’re doing and it will only enhance your experience. Practice or learn about sustainable tourism while visiting. Avoid the tourist busses; while local ones might be slower, they are less expensive. Costa Rica has seasonal weather so please do check up on best time to visit Costa Rica before planning your tour.